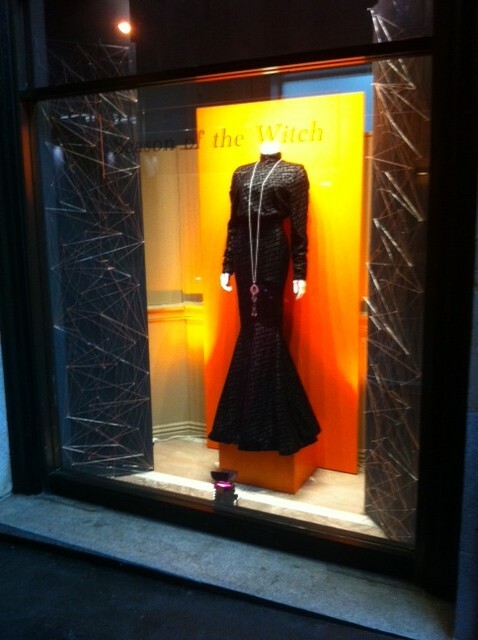 625 Polk Declares the Season of the Witch! Lisa Hegner’s design for the 2012 Saudi Project on display at 625 Polk Street. Window designed by the Visual Merchandising Graphics Class. Photo courtesy of Russell Clower. Happy Halloween, fashion students! Today, the windows at 625 Polk have been tricked (and treated) out to celebrate the “Season of the Witch” here at the School of Fashion. 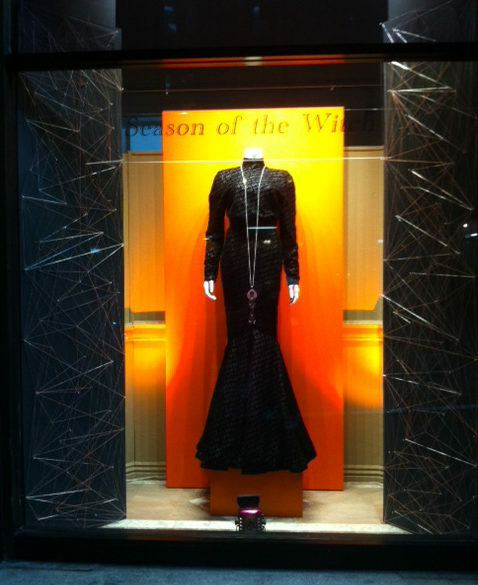 The wickedly fabulous window features Lisa Hegner’s design from the 2012 Saudi Project as the focal point that the Visual Merchandising Graphics class (FSH 427) used for their display. Led by instructor Martin Zanfardino, the class was challenged to create a holiday-themed window that functioned more as a “fashion” display vs. a gimmicky, seasonal display. The flanking side panels used string and nails to create the spiderweb-inspired detailing around the window’s border. Cut crystals and pearls decorate the nail heads within the string art, creating the frame around dress. In addition, the all-over pattern of triangular geometry created by the strings and nails was designed to complement the small, geometric shapes in the burn-out, black velvet patterns on the dress. The addition of footlights using color gels adds to the overall drama of the display. Photo courtesy of Russell Clower. The window’s tagline, “Season of the Witch”, refers to the psychedelic ’60’s song by Donovan, as well as other, more recent pop references (including the Vanilla Fudge cover). The hot orange background was chosen for the obvious Halloween reference, as well as the feverish quality of the hue itself. 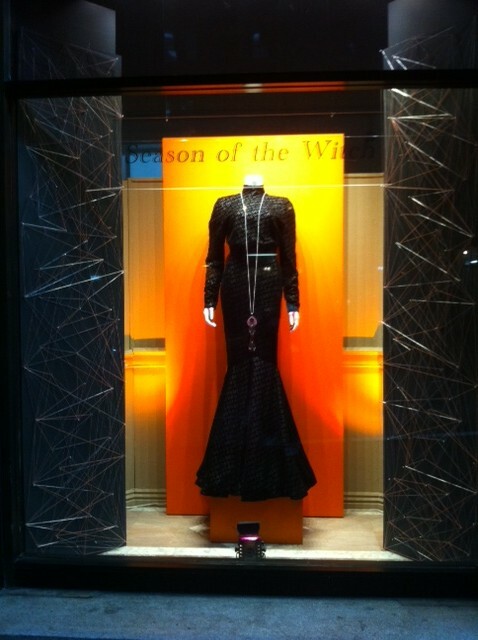 For us, this window display is definitely haute! A special thanks to Woori Han, BFA Fashion Visual Merchandising, and Gina Chou, MFA Fashion Merchandising for their assistance with the project.